REACH is the Regulation for Registration, Evaluation and Authorisation of CHemicals in the European Union. To improve the knowledge of the impact of chemical substances on human health and the environment. To restrict their use if appropriate. OUR PRODUCTS DO NOT CONTAIN ANY SUBSTANCE POTENTIALLY SUBJECT TO ANY REACH RESTRICTIONS. after 28 days: “health-related evaluation” by limitation of VOC emissions and carcinogenic VOC. DIBt has made this evaluation procedure mandatory and AgBB approval is now a legal requirement to market a flooring product in Germany. VOC emissions measurement by external lab. GERFLOR PRODUCT RANGES COMPLY WITH AgBB PROTOCOL. GERFLOR FLOORS ARE FLOORSCORE CERTIFIED. USING ONLY GERFLOR PRODUCTS ON A PROJECT CAN BRING 1 POINT ACCORDING TO LEED CREDIT ON LOW EMITTING FLOORING SYSTEM. Similar to Floorscore, but not specific to flooring. This evaluation procedure takes into account emissions after 7 days: limit values for TVOC and aldehydes. SPM WALL PROTECTION AND HANDRAILS ARE IN THE PROCESS OF GREENGUARD CERTFICATION. Finland evaluation procedure: after 28 days, TVOC, formaldehyde, ammoniac, carcinogenic and sensory evaluation. GERFLOR PRODUCTS COMPLY WITH M1 REQUIREMENTS. WE HAVE GOT SOME PRODUCTS M1 CERTIFIED BUT HAVE NOT DONE. IT FOR ALL OUR PRODUCTS. after 28 days: of VOC emissions and carcinogenic VOC. GERFLOR PRODUCT RANGES VOC EMISSIONS COMPLY WITH THE BLUE ANGEL REQUIREMENTS. BUT OUR PRODUCTS CAN NOT HAVE THE BLUE ANGEL CERTIFICATION AS BLUE ANGEL EXCLUDES VINYL PRODUCTS. This procedure measures VOC emissions after 3 days and 28 days. GERFLOR PRODUCTS COMPLY WITH THIS PROTOCOL. This Scandinavian procedure measures VOC emissions after 28 days & 26 weeks. GERFLOR HAS BEEN AN ACTIVE MEMBER OF ERFMI. GERFLOR CONTRACT PRODUCT RANGES HAVE A FDES. GERFLOR HAS BEEN ACTIVELY INVOLVED IN THIS APPROACH. GERFLOR CONTRACT PRODUCT RANGES HAVE A FDES. BRE (Building Research Establishment) is a UK based independant third party approvals body offering certification of fire, security and sustainability products and services to an international market. BREEAM is the assessment method developp+ed by BRE. ALL GENERIC FLOORING SPECIFICATIONS CORRESPONDING TO GERFLOR COMMERCIAL PRODUCTS HAVE BEEN GIVEN AN A/A+ RATING ACCORDING TO THE BRE GREEN GUIDE, A+ BEING THE BEST RATING ON A+ – E SYSTEM. complies with all environmental standards. is committed to continuously improve its environmental performance. GERFLOR INDUSTRIAL SITES ARE ISO 14001CERTIFIED. TROISDORF FACTORY IS ALREADY OHSAS18001 CERTIFIED AND OUR OTHER FACTORIES ARE IN THE PROCESS. How flooring systems can contribute to leed™ certification? Credit 6 : Rapidly renewable materials. Credit 7 : Certified wood. Credit 4.1: Low-Emitting Materials - Adhesives and Sealants. Credit 4.2: Low-Emitting Materials - Paints and Coatings. Credit 4.3: Low-Emitting Materials - Flooring Systems. LOW EMITTING MATERIALS: FLOORSCORE CERTIFIED PRODUCTS. PRODUCTS CONTAINING PRE-CONSUMER RECYCLED MATERIALS. 2 LEED™ SPECIALISTS PART OF GERFLOR STAFF. LEED™ ON LINE CALCULATOR AVAILABLE ON GERFLOR WEB SITES. In Australia, the local Green Building Council has developed a voluntary rating system for buildings, similar to Leed (Green Star rating) but they have also defined the Best Practice Guidelines for the Life Cycle of PVC Building Products, including PVC manufacturing criteria. 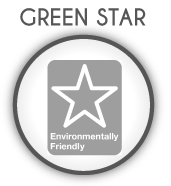 CONTRIBUTION TO GREEN STAR CERTIFICATION WITH PVC FLOORS RATED AS GREEN STAR MATERIAL. Target n°2: Integrated choice of construction processes and materials. Target n°12: Sanitary conditions of indoor spaces. Target n°13: Indoor Air Quality. The HQE approach is based on the Life Cycle Analysis (LCA) of the building which leads to the creation of an environmental data sheet FDES with both environmental and health datas.